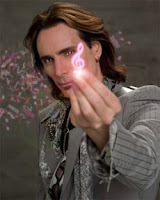 Steve Vai will be a guest at the National Guitar Workshop’s Rock Summit in Purchase, NY on July 20. Steve will discuss his technique and take part in a question and answer session as part of the Rock Summit. As a Grammy award-winning guitar virtuoso, Steve Vai’s sheer breathtaking facility on the guitar is acclaimed in the rock world and beyond. Starting with his groundbreaking “Passion and Warfare” album in 1990, and throughout the years since, Vai has consistently used music as a microscope peering into the human spirit, with equal attention paid to both the darkest obsessions and the most exalted impulses contained there. While Vai clearly had what was needed to make indelible impressions during his stays with Frank Zappa, David Lee Roth and Whitesnake, it’s as a solo artist that he’s made his most precious contributions. Each of his solo releases are unique, varied, compelling and, even when the music is looking darkness square in the face, genuinely uplifting. His most recent studio album, “Real Illusions,” is a major achievement from a musical alchemist of the highest order. In addition to his recording career, Steve is involved with many worthwhile organizations. He is a former Trustee for NARAS (National Academy of the Recording Arts and Sciences), a board member for Hollywood Arts, and works closely with his own Make a Noise Foundation, raising money for music education. Steve has just finished a live concert DVD entitled “Where the Wild Things Are.” The two hour and forty minute concert film, which was filmed in Minneapolis, will be released in August. CLICK HERE for more information about the National Guitar Workshop’s Purchase, New York programme. This will entitle a discount of $100 of tuition. Valid from 6/5/09 and ends: 6/26/09. This special offer cannot be combined with any other offer. Only valid for students not currently registered with NGW. So this morning I noticed I was getting a whole lot more Twitter follower notifications than usual. I was wondering why, before finally realising that the Shadrick Guitar Blog (the blog of Jason Shadrick from National Guitar Workshop) had posted a great article entitled Top 10 Guitar Related Twitter Users. Among the names were yours truly, as well as my buddies Guitar Noize and Mad Stratter, not to mention Living Colour’s Vernon Reid. Head over to the article for the rest of the names and all of the Twitter IDs, and CLICK HERE to follow me on Twitter. I have a feed set up to publish my headlines and story links automatically, but I also post random things such as what articles I’m working on at the time, and stuff like that. Recently I called for readers to submit questions for my forthcoming interview with Dimarzio pickup designer Steve Blucher (There’s still time to submit questions, I might add).